The morning headlines brought news of the passing of Senator George S. McGovern. For many generations this is a sad day and then for sure there are the younger generations who have no idea who McGovern was and all that he stood for as an American and an advocate for numerous social issues. Over the next few days articles of tribute or simple obits will appear in newspapers, magazines, online news providers, and on network and cable news shows. Many will mention the facts that he was a WWII decorated war hero, a history professor, a US Representative, a US Senator...and was the Democratic presidential nominee in 1972. Although he lost that election...he remained in the Senate until 1981 and he continued to be involved as a national and worldwide advocate in the arenas of agriculture, food, nutrition and hunger. 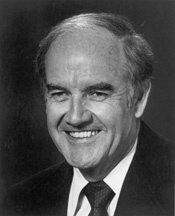 There may be many who will be surprised to learn that McGovern first drew attention to the stigma of mental illness when he, sans a complete vetting of his vice-presidential nominee, found himself embroiled in a national political debate whether to keep Senator Thomas Eagleton on the '72 Democratic Presidential ticket. You see even though Senator Eagleton had a stellar educational and professional resume and was the sitting US Senator of Missouri two weeks after the Democratic Convention it was discovered that Mr. Eagleton had been treated in the past for clinical depression, receiving electroshock therapy. Nominated to be Vice-President on July 12, 1972, Eagleton withdrew his nomination on August 1st, to be replaced by Sargent Shriver. It has been reported that McGovern really wanted to support keeping Eagleton on the ticket because McGovern's daughter Terry was also struggling with depression. "A fervent McGovern says now that his original support of the embattled Eagleton was genuine, stemming from reasons both nakedly political and intensely personal. Certainly, he says, he did not want the fallout that would follow the jettisoning of a running mate. But neither, he adds, did he wish to send a discouraging signal to his daughter Teresa, who was seeing a psychiatrist at the time for her own depression, and who, McGovern feared, might view Eagleton's downfall as evidence of a stigma borne by anyone who received psychiatric treatment. 'I wish I had stayed with my initial judgment to keep Tom' on the ticket, McGovern says. 'I could have stood up for him had I known more about mental illness at the time. I didn't, and the price I paid politically was --' He can't settle on the right word. 'Catastrophic,' he mutters finally." On December 13, 1994, Teresa McGovern, one of McGovern's five children, fell into a snow bank. She was intoxicated and died of hypothermia. She had suffered from alcoholism for more than three decades. Following Terry's death Senator McGovern decided to chronicle her story and his story as a parent of an alcoholic who also suffered from depression. In 1997 he published this memoir: "Terry: My Daughter's Life-and-Death Struggle With Alcoholism." Senator McGovern and his wife Eleanor used the book sale proceeds to establish the Teresa McGovern Center in Madison, WI. This past summer, once again Senator McGovern lost a second child to the disease of alcoholism. It was very briefly reported that Steven McGovern passed away on his 60th birthday, July 27, 2012. The press release stated simply: "Steve had a long struggle with alcoholism. We will all miss him deeply, but are grateful that he is now at peace." We are sure as the book closes on the remarkable and stellar life of George McGovern it is important to remember that he was many things, but mostly he was a loving husband and father. With courage and compassion he shared his private tragedy of his inability to save his children and wanted other parents to know that he understood their struggles. He also knew the importance of finding one safe place where recovery can begin.